It can be hard for today’s students to find quiet time for study and contemplation. Whether they are reading for pleasure or working on their thesis projects, there always seem to be distractions—a text coming in, a friend stopping by. But distraction isn’t just a modern-day issue; it’s been a historic problem for Vassar students. In her 2015 Commencement speech, media icon Arianna Huffington encouraged students to resurrect a Vassar custom that students generations before had used to break the stream of interruptions—“sporting the oak.” The practice consisted of placing an acorn emblem on a closed dorm-room door to indicate that a student didn’t want to be disturbed. 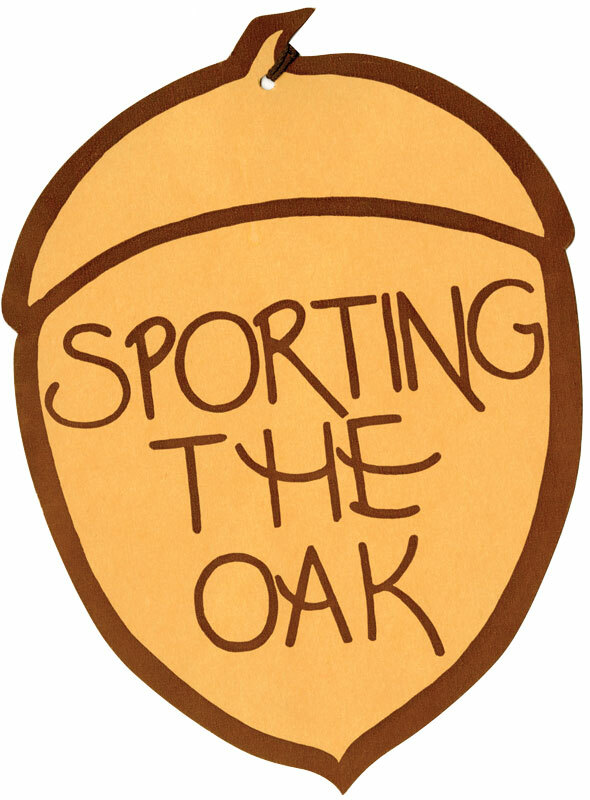 A brief history of the custom is printed on a “sporting the oak” emblem donated to the Vassar Archives by Gail Dunlap ’59. The emblem notes that the custom originally came to Vassar in the late 19th century, but fell out of favor before returning with gusto in the late 1930s. The term and the custom were actually imported from 18th-century England, first catching on at Oxford and Cambridge universities. An October 23, 1940, Miscellany article about the history of the custom states that, in England, rooms had two doors—an outside door made of pine and an inner door of oak. When someone went to visit a student, he could open the pine outer door, but if the inner oak door was closed, the visitor would leave. It was considered exceptionally ill-mannered to open a closed inner door at British universities. While no one knows precisely when the custom appeared at Vassar, it seems its resurgence in the late 1930s came with encouragement from the administration. The article goes on to say that the signs—distributed by the health committee—were taken seriously. The practice was still around nearly 20 years later. A February 25, 1956, Vassar Chronicle article quotes several students who were asked about their thoughts on the practice. Most seemed to think something was needed to minimize distractions, but some questioned the method. The late Stephanie “Stranny” M. Yater ’58 told the Chronicle that she supported it, but not enough students were in agreement with her. “I think it’s a good idea, but no one takes it serious. They think it’s a joke,” she opined. No one can pinpoint exactly when sporting the oak fell out of practice. What’s certain is that students today are constantly bombarded with tweets, posts, calls, and other distractions. Huffington—herself a social media maven—says that enough is enough.